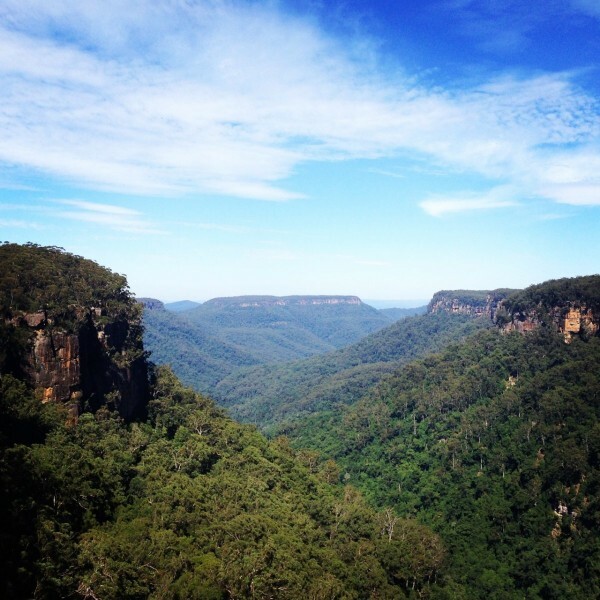 If you’re looking for things to do over the Easter long weekend, why not consider a road trip to the Kangaroo Valley region. 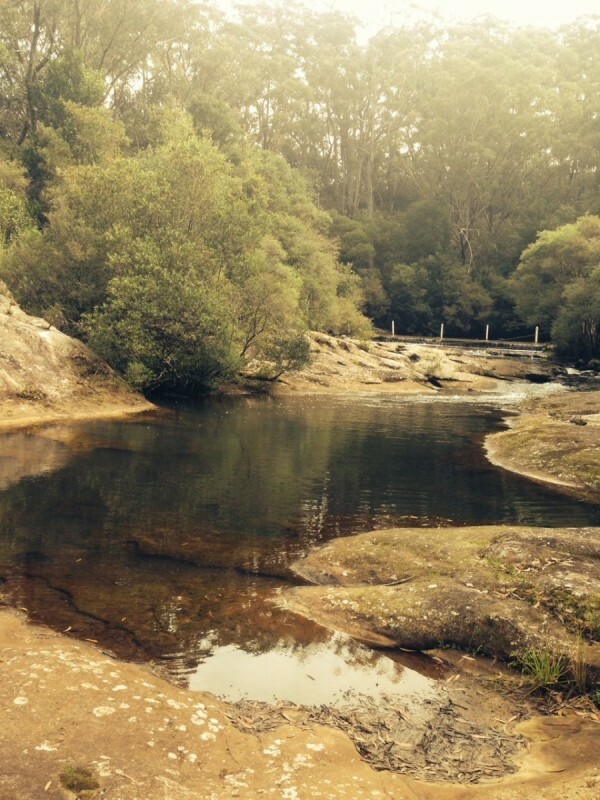 My most recent road trip took me through the beautiful landscapes of the Kangaroo Valley – only about a two-hour drive from Canberra along the Hume and Illawarra Highways. One of the stops on this road trip was the popular tourist spot of Fitzroy Falls, which is located just off the Illawarra Highway. 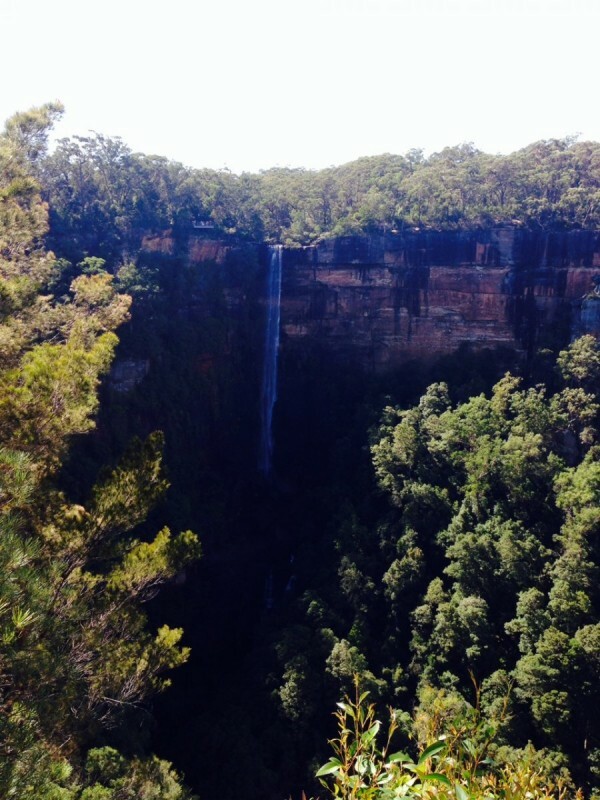 Fitzroy Falls has established paths, a visitor centre, café and other facilities such as picnic tables. Parking on site is $3 per car. It’s a short walk to the first lookout which hangs at the top of the Fitzroy Falls and has spectacular views out to the mountains beyond. To get a better view of the falls, head to the next lookout, which is located about five minutes further along the track. I preferred this lookout to the first one as you get a full view of the falls. 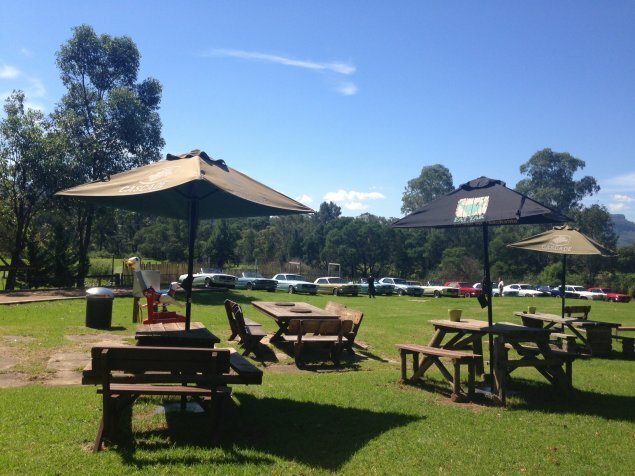 For lunch, we decided on a pub lunch and chose the Friendly Inn Hotel on Mona Vale Road in Kangaroo Valley. This pub has a fantastic beer garden out the back with large tables shaded by trees and umbrellas. It’s also a good spot for families with a playground for the kids, as well as a giant chess board. This place has a good menu filled with burgers, the typical schnitzels and parmi dishes, and other pub fare. It’s all fairly reasonably priced for a tourist town and the meals are huge – I didn’t even get through half of my meal. As you would expect, the town also has a good selection of shops for gifts, home wares, lollies and baked goods. Venturing on with full stomachs, we headed onto Belmore Falls. 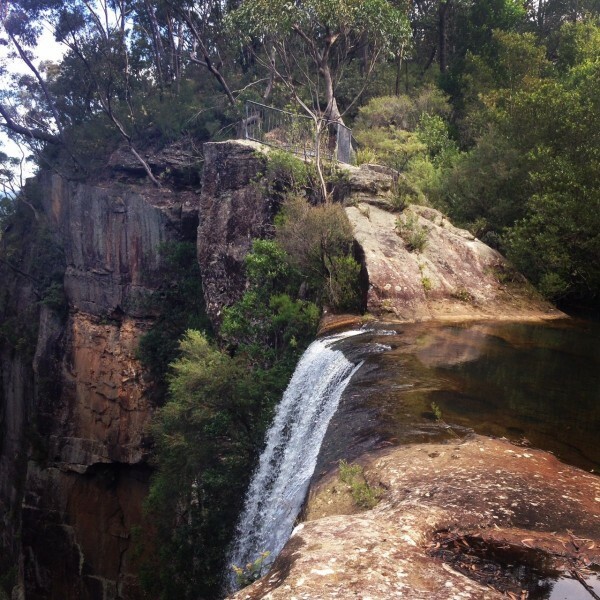 There isn’t signage all the way but the route we took from the Friendly Inn Hotel took us back towards Fitzroy Falls on Moss Vale Road, and just before the reservoir you turn onto Myra Vale Road and then there’s signs a few kilometres along pointing you to Belmore Falls. 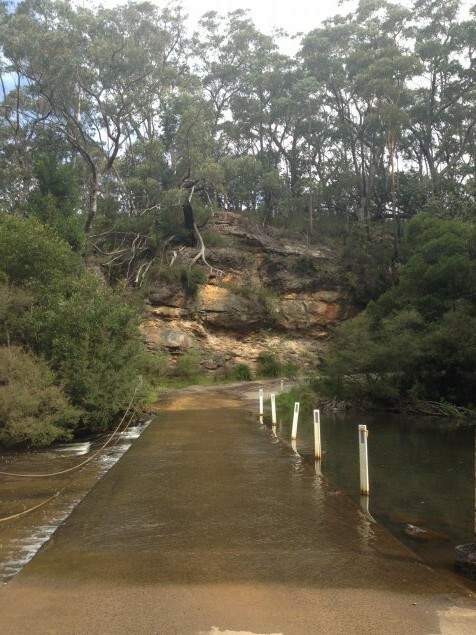 It’s an unsealed road part of the way into Belmore Falls but easily accessible by a 2WD. There is a low bridge (pictured below) however with flood level markers, so if there’s been recent heavy rainfall you may not be able to get up to the lookout. If you head up to the lookout it has a good view of the falls, which cascade over two levels. If you want to have a quick dip, stop by the low bridge (there are some parking areas nearby). There’s a lookout there as well, but if you’re game you can go for swim above the waterfall. The water is now a little chilly but on a sunny day it’s still worth a try. This is another place that seems quite undiscovered and off the tourist trail – there were only a handful of cars near the lookout and no one at the top of the waterfall when we stopped for a swim. 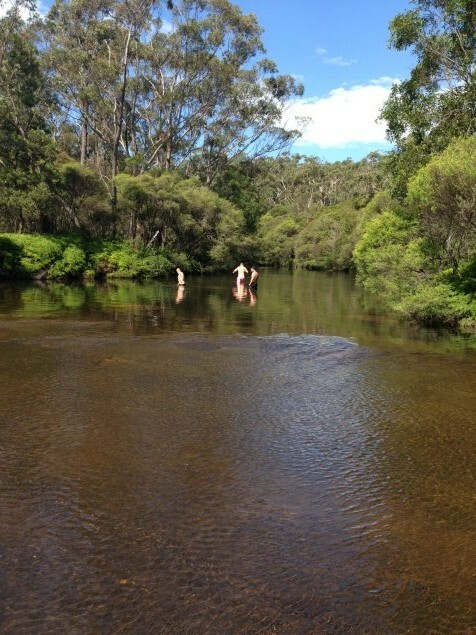 If you have small children, Carrington Falls is only about 30 minutes further along the Illawarra Highway and Jamberoo Mountain Road and is a better place for children to swim as there are more protected swimming spots (pictured below) away from cliff edges. 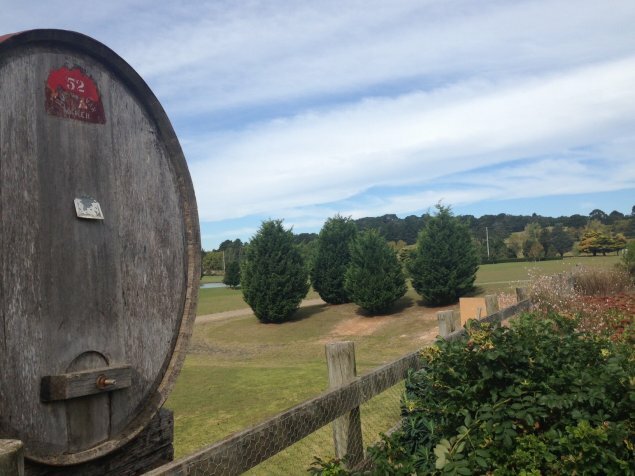 Of course, no road trip to the Kangaroo Valley is complete without a winery stop. Southern Highland Wines is located off the Illawarra Highway at Sutton Forest and is a convenient stop on the way either to or from Canberra. Southern Highland Wines has a restaurant and a cellar door. The restaurant was very busy on our stop with nice views of the surrounding area and a reasonably priced menu for a winery. these road trip articles are great. I have always used a manual set while driving uphill. This destination is on my to do list after this article. Sorry, i should have been more clear. I have automatic Hyundai i20 and I don’t intend to go off-road. 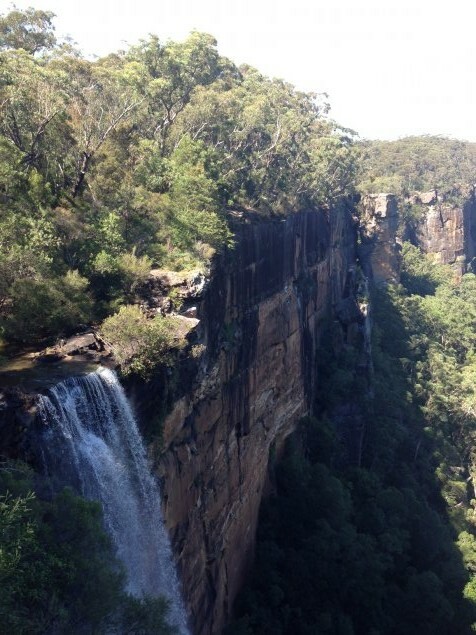 All I want to do is to travel from Sydney to Jervis Bay and I think the road passes through Kangaroo Valley. My question is that can I drive through Kangaroo Valley while remaining in automatic mode on my i20, or would I have to shift to manual mode or i20 is simply not suitable for this travel? You should shift to manual mode to ascend and descend mountains in an automatic vehicle. Going down the auto shifts into the highest great because there is no load. This in turn increases your vehicle speed because there is no engine braking and your brakes will overheat because they are doing all the work. Driving up you should use manual mode to minimize your gear changes. The constant gear changes associated with constant acceleration and deceleration can overheat your transmission. It can also make your car use more fuel because every thing is working harder. Hold your gears, smooth acceleration and your cart will be happy. Oh, & your I20 will quite happily do dirt roads. Dirt roads are not “off road”. Thanks a lot, that’s very useful info. While we are at it, please also advise if I can transfer my car from auto to manual while driving, or I need to stop, take it to Neutral and then go to 1 and then to 2? Thanks. Have a look at your owners manual, it will tell you but you shouldn’t have to do that. I hedge not driven an auto with a manual shift yet where you have to. I just drove my own car to Adaminaby via the Boboyan road moving in & out of manual shift mode while driving at all speeds. Then you can head up over Mt.Scanzi to Nowra and maybe return via Nerriga and Braidwood.A really full day. Not through Nerriga and Braidwood as that road is not all sealed. Turn right just after Nerriga to Ollan Ford and then to Tarago which is totally sealed. Is it easy to travel on Hyundai automatic hatchback i20 through Kangaroo valley or would I need to shift to manual? Thanks. If you’re going to KV for the roads, rather than grabbing a manual i20 over an auto i20, you may as well just not take an i20 and grab an MX5 or Clio Sport or motorbike or something. Go for something good like a WRX, Evo or even the unfairly maligned Holden Clubsport or Falcon Xr6T but for chrissake dont go for either of those two. If I was to pick a Jap convertible a Honda S2000 would be my choice, it has the go to match the looks!